With only so much time to go around, parents often spend 3,000 hours less with their second child. Economics researcher Joseph Price embraces three of his four children. It’s bedtime, and you’re reading Goodnight Moon to your 6-year-old daughter and 4-year-old son. “Goodnight noises everywhere,” you whisper, then quietly close the book, hoping it has done its job. Not quite. “One more!” your children beg. “Maybe tomorrow night,” you say and tuck them in. You stop and think. It’s true. But what can you do? Emily and Brian fight over what they want you to read, and you don’t have time to read to them separately, so you usually end up reading the one book they can agree on. Plus, your energy has waned, and you feel spread thinner with every passing year. While parents may spend equal time with each child on any given day, they tend to spend progressively less total time with their children as their parenting years advance. This parent’s dilemma represents the norm in families throughout the United States, though few fully recognize what’s happening. A recent study by Joseph P. Price (BA ’03), a BYU economics assistant professor, is waking up parents with his finding that, by and large, firstborn children get about 3,000 more hours of parental time between the ages of 4 and 13 than second-borns. In an article published in the Journal of Human Resources, he says that while parents may spend equal time with each child on any given day, they tend to spend progressively less total time with their children as their parenting years advance. As the amount of parenting time gets smaller, the second child garners less total time. Price explains what typically happens in families: “As your firstborn gets older, reading to him starts to drop off. You say, ‘Oh, he knows how to read now; I don’t need to read to him.’ But at the same time you stop reading to your firstborn, you read less to your second-born, who is younger. Also, as the firstborn gets older, you start to watch more television with him, which means you’re watching more television with your second-born when he’s at a younger age. Price believes his conclusion could partially explain the results of recent studies that found firstborns outperform second-borns in many measures of success. Firstborns generally get more and better education, score higher on tests, and end up with jobs that pay more. Price became attracted to this area of study while working on his doctorate at Cornell University. 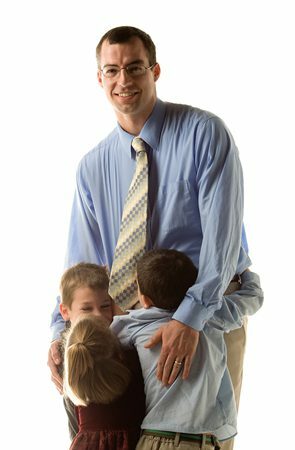 He had three children at the time (he now has four), and classmates often cautioned him that if he had more children they would all suffer because he wouldn’t have enough time to properly parent them. “The analogy people usually use is the pie. You have to split the pie among more kids, and so each kid gets a smaller piece. So I was really interested in this question of family size and how much time parents spend with their children,” he says. At about this same time, in 2004, the first American Time Use Survey was published by the U.S. Department of Labor’s Bureau of Labor Statistics. Some 21,000 Americans were interviewed by telephone about the amount of time they spend doing activities such as work, childcare, housework, watching television, volunteering, and socializing. Price pored over the survey results to find out more about how much time parents spend with firstborns versus second-borns. What he found startled him, fellow researchers, and those who saw news coverage that followed publication. “Firstborns get about 20 to 30 minutes of attention more per day than second-borns,” says Price. The gap is biggest for the most important activities—reading, talking, playing together, and eating dinner together. Activities not considered quality time, such as watching television and picking up and dropping off in the car, are big time-eaters in American society. “TV with the kids is 52 minutes a day compared to 42 minutes eating together and 2.5 minutes reading,” says Price. Shifting even a few minutes from TV to reading together can make a difference, he says. When he examined his own life and asked himself how much time he spends with his children, Price found that he, too, had spent more time with his firstborn than he spent with his later-born children. “Apparently, it happens naturally in most families,” he says. Parents should keep in mind that families are complex, as are the factors that contribute to a child thriving and growing into a flourishing adult. Price says that parents should keep in mind that families are complex, as are the factors that contribute to a child thriving and growing into a flourishing adult. These factors include genetics, the positive and negative personality traits of parents, the quality of the parents’ marriage, peer influence, media influence, and the impact of teachers in school and church. From a gospel perspective, children bring premortal experiences to their mortal lives, use their agency in unpredictable ways, and react idiosyncratically to the influences in their lives, both positive and negative. Sue Bergin is a hospice chaplain and a writer in Orem, Utah. Survey: How Are You Using Your Time? The quality vs. quantity debate has gone on for several decades, and Price believes that parents should pay close attention to both. Quantity matters, and so does quality. He suggests parents take an informal time-use survey to gauge how they’re doing and make adjustments if needed. • How many times this week did we eat dinner together as a family? • How many times did we read together? For how long? • How much time did we spend watching television together? • Did I wrestle with the kids this week? • How many “chauffeur trips” did we provide this week? Can we reduce those and spend more time in quality activities? • Are we spending time just talking to each of our children?